A film that should be as good as the sum of its parts, The Man Who Knew Infinity fails to prove its worth. Dev Patel stars as Ramanujen, a young man from Madras, India who can calculate complex mathematical theorems without the benefit of an education or even an understanding of the formal laws of mathematics. When he sends some of his work to Cambridge mathematician G.H. Hardy (Jeremy Irons) in the hopes that the professor will help him to get it published, Hardy sees Ramanujen’s brilliance for what it is. Leaving his wife (Devika Bhise) and mother (Arundhati Nag) in Madras, Ramanujen heads for Cambridge to work with Hardy. There he has to deal with homesickness and constant discrimination from students and professors alike as he learns how to prove the theorems that he already knows to be true. There’s much to like about The Man Who Knew Infinity. Patel and Irons makes an excellent team, each portraying characters suffering under their own peculiar weights of isolation and passion for mathematics. Ramanujen’s problems are clearer in some ways: he’s displaced and lonely in the midst of an entirely foreign and often hostile world, and attempts to maintain his identity while also fitting in. Hardy’s issues, however, are somewhat clouded: distant but passionate about his work, he’s torn between his faith in his colleague and his constant need for proof in order to truly believe. It is a testament to Irons that he can put so much conflict into a single glance, for Hardy does not reveal a thing that he doesn’t have to, either to the viewer or to Ramanujen. The story that surrounds them is a compelling tale of triumph against adversity, centering on the brilliance of a young man who manages to confound some of the 20th Century’s greatest mathematicians with theorems that he simply knows are true. There is every single argument here to be made for The Man Who Knew Infinity. So, why doesn’t it work? Why does this film fail? All the pieces are there, yet somehow they never come together. Some of this must have to do with the film’s failure to present a coherent picture of what’s really at stake with Ramanujen’s theorems. While we can appreciate the spectacular nature of a man who can simply see the answers without knowing how he got there, the context of his work still manages to remain obscure. There are missing pieces to the story, as though an entire separate film was needed to explain what we’re watching. This lack of exposition should not really damage The Man Who Knew Infinity, if it managed to conjure any kind of tension for its protagonists. 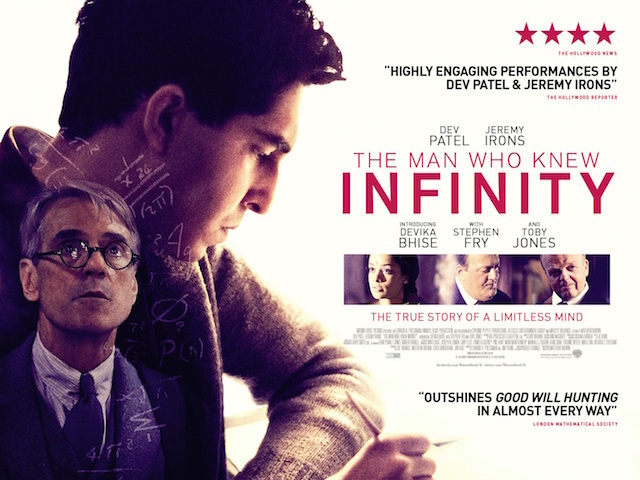 Much of the film is taken up with Hardy pushing Ramanujen to actually learn how to do mathematical proofs so that he can show that his theorems work, yet little time is spent on what this means. I can grant that math is not the most cinematic of topics, but if you’re going to make a film about mathematicians, you need to explain at least a little bit of what this math actually means, and the context in which it even exists in the first place. Ultimately though, I think I must lay The Man Who Knew Infinity’s failures on the shoulders of the director and writer Matthew Brown, who substitutes swelling music and sonorous pronouncements of Important Ideas for actual plot arc and narrative tension. The film loses its focus more than once, snapping back to scenes of Ramanujen in his room or Hardy at his desk without taking the time to set up proper conflict or catharsis. Tension at home between Ramanujen’s wife and mother distract from the story of the two leads without contributing much except occasional conflict that doesn’t go anywhere. Meanwhile, Hardy and Ramanujen argue about God, gods, and faith, yet neither Hardy’s atheism nor Ramanujen’s faith feel true. This is a film that has no real spiritual sense, that forms an argument about belief without taking the time to show what belief really represents to its characters. I wanted to like The Man Who Knew Infinity. The cast is good, the story remarkable, and there is no reason why a good movie shouldn’t have come out of all this. Its failure, I think, has more to do with the director’s inability to produce a cohesive narrative than it does with any real flaw in the idea itself. It’s a shame, too, because this story deserved so much better.